Quilting Adventures: Lack of mojo! Hello, remember me? I'm the one that's been neglecting my blog. I just cannot seem to get back in the groove of things. 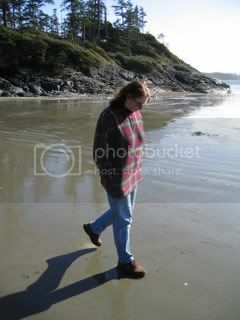 This morning, after I read an e-mail from Pam, it dawned on me what one of my problems might be. She said "I have so many things I'd like to do but everything seems to be so disorganized right now that when I go into my sewing room I just look around in awe at what a hodge podge it is and then do nothing! Maybe I need to get that Mark Lipinski magazine and get myself sorted out - LOL!! " You and me both girlfriend! 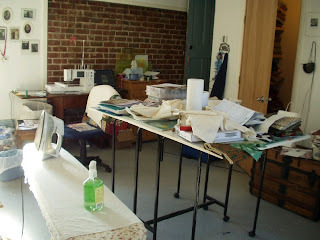 So, after reading Pam's e-mail I walked into my sewing room and this is what greeted me! Sadly, I cannot even blame it on being creative! If that wasn't messy enough for you, to avoid any embarrassment, I took the picture after I folded the two (2) loads of laundry, one was on my cutting table (if you can believe it) and the other on the dryer (not pictured). 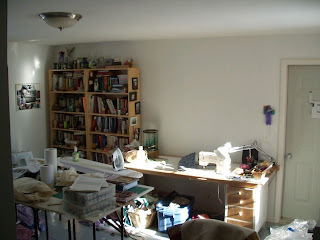 Here's another picture from the opposite corner of the room! So guess what I'll be doing today? I'm on a mission of major cleaning and organizing! I've got to get my creative mojo up and running again! So many projects I want to finish! I mean, the Winter Sentry is not even finished yet! I ran out of thread and could not find it at my LQS. Prior to making an order on-line, I always look at my supply to see what else needs re-stocking and guess what? Yes, another spool of yellow 961, the one I needed, was found in the disorganized thread box! Need I say more? So I think I'll take Darlene's suggestion and buy my copy of Quilter's Home Magazine. It doesn't appear that my subscription will start in December! I agree, when it is messy I just walk around and do nothing. Good luck with the cleaning. My room is in need of a good cleaning too and I agree - it can really mess with your mojo. Hang in there!!!! And Darlene's article is good. Well the one she talks about. Most of us can't work in messy areas so why do we allow the MESS to take control? LOL My room is a MESS again and it's making me crazy. Guess what I'm planning to do today? You guessed it! How true, how true... the messiness really gets in the way of anything close to productive ~ but I don't understand why we have to keep rediscovering this fundamental fact over and over and over again :-> Hope things are less messy today! I'm glad I'm not the only one that feels that way once in a while. Sometimes it feels like the room is closing in on me with all that mess. You'll get things organized in no time and back at it. I should get that magazine too. Actually I wandered in today and made a little bag for Anri from some Amy Butler fat quarters!